If the word ‘knitting’ conjures up images of auntie Sally’s itchy acrylic yarn and plastic yellow needles, think again. 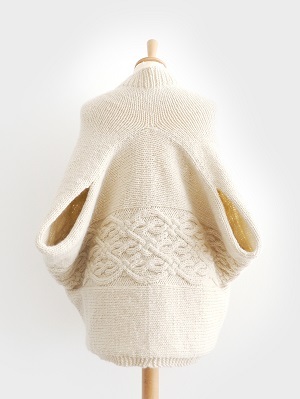 Modern knitting is all about precious natural fibers, softly tactile textures and stylish designs. Here’s the definitive guide to the perfect Christmas present for the cool, creative knitters in your life. This is the yarn equivalent of angel’s breath: 100% cashmere yarn, undyed and untreated, in a wonderful DK (double knitting) weight. Spun (mainly) in Italy for The Wool Company, a family-run business in Cornwall. 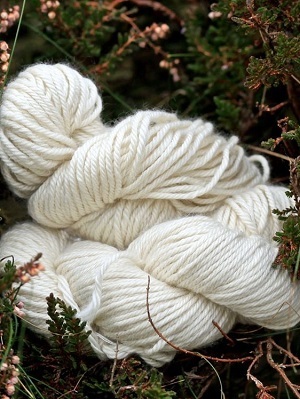 (£19.80 for 50 grams, plus postage, The Wool Company website). Forget about chintzy flowers. 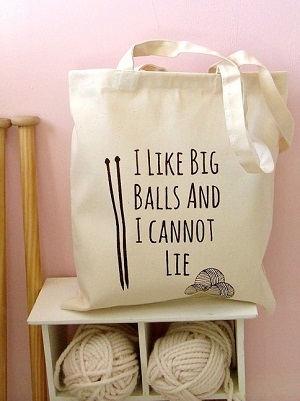 Kelly Connor, an artist based in Aberdeen, Scotland, makes quirky tote knitting bags with funky slogans, perfect to show off on public transport. I like big balls and I cannot lie (remember Sir Mix-A-Lot?) is my tongue-in-cheek favourite. 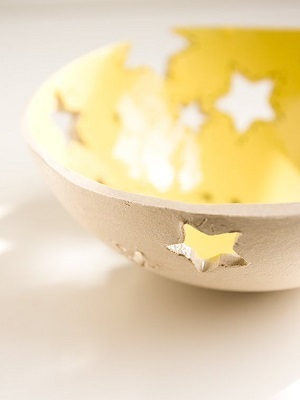 KaroArt’s stoneware clay knitting bowl matches the star at the top of the Christmas tree! Unglazed and beautifully textured on the outside, brightly yellow glazed on the inside, it has a comet-shaped slot for threading the yarn through and a star-shaped opening on the rim to support the knitting needles. Handmade in Dublin, Ireland. Looking for something as elegant as a kimono and as warm as an Aran jumper? Kyoko Nakayoshi is a London-based Japanese knitting designer who blends Japanese and Western aesthetics in innovative ways. Her textured and delicate knitting patterns are available on her website, Cotton & Cloud, as well as in books and magazines in the United Kingdom and the United States. 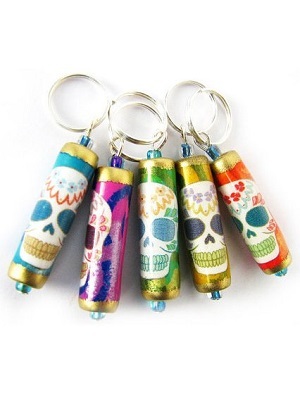 There are many stitch markers out there, but not as spooky and cute as these ones! Sugar skulls are votive figurines, traditionally used in Mexico to celebrate the Day of the Dead. This set of five stitch markers (the little hooks or rings used to mark specific stitches in a pattern) is handmade in England from small glass beads and lightweight paper beads. It fits all sizes of knitting needles up to 10mm (US 15). This is where I will be from next January and I am truly excited! Suitable for beginners, this course aims at exploring alternative materials and scales in knitting. You will get to use giant knitting needles, make knitting devices of your own and work with non-traditional materials including rope, wire and plastic. In the photo: Johan Ku’s Emotional Sculpture, 2004. If you have never tried lace knitting before, make this an aspirational buy… Shetland’s lace stitches, with names like ‘Crest of the Wave’, ‘Razor Shell’ and ‘Cat’s Paw’, have been used by the women of the Northern Isles for hundreds of years. 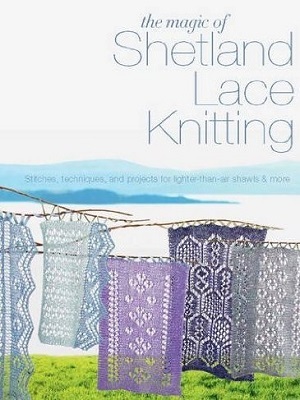 This book by Elizabeth Lovick, the Scottish designer behind Northern Lace, introduces the ethereal beauty and intricacy of Shetland lace knitting with stitches, techniques, and projects for lighter-than-air shawls, scarves, hats and more. 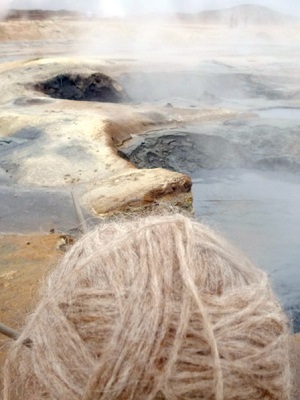 Iceland is a wonderful place with a great knitting tradition (you can buy yarn at the supermarket!). These tours, a collaboration between Icelandic designer Hélène Magnússon and Icelandic Mountain Guides, mix knitting with the beautiful Icelandic nature. Participants explore the island hiking, trekking or by short walks and meet local knitters, spinners, dyers, designers and farmers. Every knitter deserves some truly scrumptious tools! Lantern Moon knitting needles are handmade in Vietnam by skilled craftspeople. Their distinctive design combines two fine woods to make the most beautiful and functional knitting needles available. 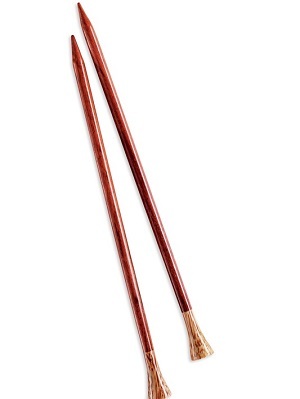 Rosewood needles have ebony tops in the thinner sizes and palm wood tops in the thicker sizes. Available in the UK from Knit with Attitude and Loop. Although there are millions of patterns online, often available for free, sometimes it is just nice to cosy up with some good old glossy paper magazine. 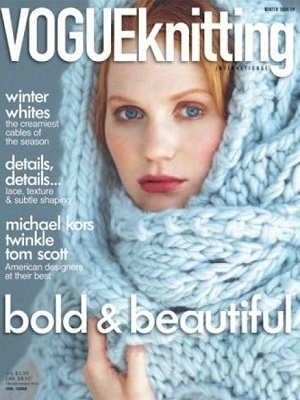 Vogue Knitting is a monthly knitting bible – as stylish as its fashion sister, minus the Devil Wears Prada chief editor.